Clearly, I got behind on the photo journaling since it has been a few days since the last post. The number of photos in need of organization is overwhelming. We went to the Kerameikos, the Acropolis Museum (no pictures allowed), the Epigraphy Museum and National Archaeological Museum. Then we travelled home and have been recovering. So far, I have labeled and organized everything up to the Kerameikos and haven't even downloaded the epigraphy and archaeological museum images. But here are some shots from the Kerameikos. I really love that place and I got a wee bit out of hand with the grave stele shots. It is one of the locations, however, where imagining what it must have looked like leaves me awed. 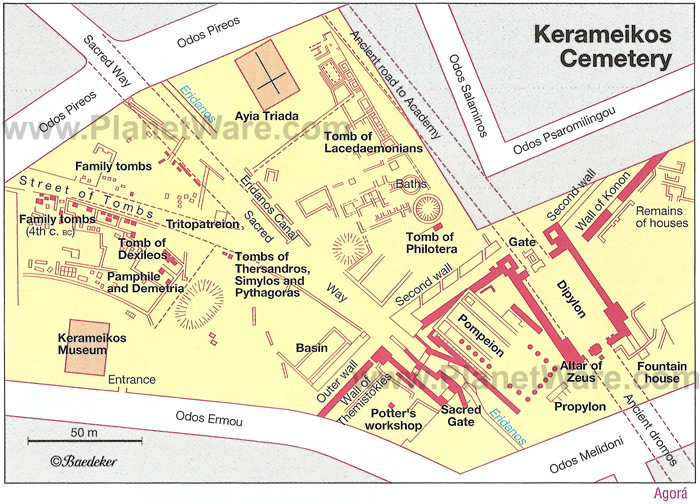 The Kerameikos was the major cemetery for Athens and sat just outside the city walls near the Diplyion gate. It is also where the Sacred Way (the road to Eleusis) began. There also was the Pompeion, where the procession to Eleusis for the Eleusinian Mysteries and the Panathenaic procession to the Acropolis originated. Remains of the Themistoclean wall run through the site (the one rapidly put together after the Persian invasion of 479 BCE with anything they could find, including column pieces, statue fragments, etc.) and then there is the Street of the Tombs. The Street of Tombs was a road into the city lined with spectacular grave monuments. In situ are replicas of some of the original tombs while the originals are housed in the museum on site. It must have been a bit creepy and a bit awe-inspiring to enter the city through the tombs. 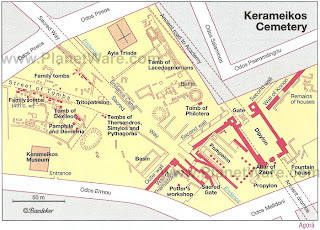 Map of the Kerameikos stolen from another website (PlanetWare.com). A portion of the Themistoclean Wall. Archaic grave monument destroyed by the Persians found in the Themistoclean Wall. The Propylon and portions of the Pompeion of Hadrian (the closer columns) and the earlier Pompeion. Altar found along the Sacred Way just outside the walls. Stele of Pamphila and Demetria. Bull that sat atop the tomb of Dionysos of Kollytos. Curse "tomb" made of lead and inscribed with names followed by "and anyone else who ever is a fellow-accused or witness in favor of them". Buried in the enclosure of Aristion between 420-410 BCE. There you have some highlights from the Kerameikos trip. Surely you don't want to see the dozens of grave markers I took pictures of. There are so many. One was identifiably a metic husband and wife, which was very cool for my research so I'll show you, though the statues or lekythoi that stood atop it are no longer there. I failed to post the last 2 days in no small part because of the overwhelming number of photos taken. Sunday was the Acropolis & South Slope, today was Piraeus, Agora, Roman Agora and Hadrian's Library. The trip to the Piraeus museum to see an inscription was mildly painful--the stone is broken in just the wrong place so that only the final 2 letters of the word I was looking at remain. And it is a deep break with no recoverable traces of letter carving. I will need to figure out some other way to prove the restoration. On the positive side,the Piraeus Archaeological Museum has some absolutely beautiful pieces and more people should take the metro down to Piraeus to see it. The bronzes (hidden in a storeroom by the harbor when Sulla invaded in 86 BCE) are spectacular. There are also a number of pieces from shipwrecks that are set up with pieces of the same scene from a different workshop where you can compare quality. And, perhaps more importantly, I saw graves for 2 metic women that have given me much to think about and kind of make up for the broken inscription. Here are some shots from the last 2 days. I will limit the more well-known sites and pieces in favor of the more unique finds. The Temple of Asklepias on the South Slope. Temple of Hephaistos from the East/North slope of the Acropolis. Cave of Aglauros on the East Slope. Aphrodite with an attitude (at the Stoa of Attalos, Agora). Herm statue support with a slightly off-center member. Ancient potty training for children (7th century BCE). A votive relief showing a cobbler's shop. The Horologieon of Andronikos (aka the Tower of the Winds) in the Roman agora. Cat in the ruin of an Muslim school built by the Ottomans. Wall of the Library of Hadrian. A cat living in the Library of Hadrian (there are also turtles). 4th century BCE tomb of a metic man and his sons. Bronze of Artemis (4th century BCE). Close-up. Note the eyes are still intact. Me and the Piraeus Athena. The facial expression is so wonderful. Bronze tragic mask from the same cache of bronzes. Theater of Dionysos: the view from the cheap seats. Theater of Dionysos: me sitting next to honorary seating from across the orchestra. That is All I'll post for now. After breakfast, we are climbing the Aereopagus and Pnyx, then we head to the Kerameikos where I have another appointment to photograph some ostraka. This afternoon is the Acropolis museum. Tomorrow (our last day), we go to the Archaeological Museum and the Epigraphy Museum.